The two short blasts were echoed by two more of a different tone; then a second response in yet a different pitch. (Top Photo) Near the entrace to Red Rock Canyon, a string of ore cars is supplemented by other freight on the morning run from Cripple Creek to Colorado Springs. The siding and crusher in the foreground once served as the loading point for casting sand and crushed stone. Photographed in 1932. (Bottom Photo) Sectionman Jim Wood pulls his track car onto the siding to clear a passing train. It was near summer bed time, but we were granted our usual reprieve to run two blocks to the entrance of Red Rock Canyon in time to see the nightly Midland Terminal Railroad freight train of about 20 to 30 empty ore cars head off for Cripple Creek. Our perch on the bank of the low cut near the red rocks permitted an intimate association with the three locomotives and their engineers and firemen as they shoveled coal to urge a good start up Ute Pass. The next morning we could take in the loaded cars of gold ore as they were bught down the pass to the Golden Cycle Mill at what was Colorado City. Brakemen walked back and forth over the ore filled cars to assist in the braking during and after descending through Ute Pass. Later in the day a single switcher locomotive pushed individual cars to dump their loads at the mill stockpiles. The distant sound of this seemingly interminable work persisted throughout the day and night. At midmorning the daily passenger train, consisting of locomotive, baggage car, and passenger car, departed from Colorado Springs, stopped at the station still labeled "Colorado City," then huffed sprightly over the track on its run to Cripple Creek. The train returned on schedule in the early evening of the same day. In the summer time the railroad often ran a Sunday wild flower excursion to Woodland Park, and in later years a ski train delivered sportsmen to the slopes. The daytime hours might also find our friend Jim Wood and other members of what was called the Colorado City Section Crew at work on the railroad right of way. Jim lived in the home of his parents in Red Rock Canyon. His father had worked in the red sandstone quarries, which had long since been closed. The sandstone, some of which was used to construct some early downtown Colorado Springs buildings, gave way to other building material. Sand from the canyon was used to make molds for sand castings, and a spur that departed from the main line at the entrance of the canyon served as a loading point years after the rails leading to the quarries had been removed from the canyon. Jim�s life evolved around the railroad, where he had held several positions. He apparently loved his relationship with iron, and had constructed a model locomotive and rolling stock to run on a 15-inch gauge track on the canyon slope above his home. He also fabricated a steam tractor, making wheels out of the ends of round boilers. Discarded engines from Stanley Steamer automobiles were the actual motive power for all of these projects. By walking a mile or so east of our Red Rock Canyon viewpoint we would find the round house, where the affable locomotive maintenance mechanics answered questions about steam motive power. A nearby yard held a stock of car wheels that could be drawn on for maintenance. A not-too-distant side trip led us to the Golden Cycle Mill, where the Cripple Creek ore was ground, roasted and treated with sodium cyanide to dissolve the gold. Zinc shavings placed in the solution plated out the gold, which was then recovered by smelting. There seemed to be no limitations on our roaming over the leaching vats. 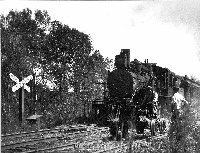 We seldom caught sight of the rotary snow plow in action, but on our trips to the yards we were reminded that it and other equipment such as cranes were part of the little railroad�s makeup. The people of one of the Colorado Springs radio stations made a recording of the last run of a train down Ute Pass before the railroad was abandoned. Some years later, members of the station played the tape through loudspeakers mounted on a sound truck, while driving down Ute Pass. This brought out many telephone calls about a "ghost train" on the loose. For a complete account of the railroad, see The Cripple Creek Road by Edward M. "Mel" McFarland, Pruett Publishing Company, Boulder, Colorado (1984). Photo Captions: Nearly all of the Midland�s locomotive roster is accounted for in this view (top above left) of the turntable and round house; now the home of Van Bringle Pottery. (above right) Sectionman Jim Wood sits at the controls of the steam tractor that he constructed out of boiler drums, pipe fittings and a Stanley Steamer engine in this 1930 photo. 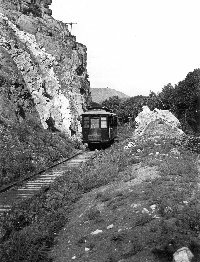 (above left) A motor car made from a retired Colorado Springs streetcar replaced the steam train for daily runs to Cripple Creek is shown passing Red Rock Canyon.